Well-worth the wait! Where can I get myself a Perkins boy?! Three years ago, I had a reading slump and Stephanie Perkins pulled me out of it with Lola and the Boy Next Door. So I was hopeful that her latest book, Isla and the Happily Ever After, would do the same thing for me this time around. It did. I adored Isla. I was completely absorbed from the first page and read it all in one sitting, refusing to let the characters go, even for a minute. There were so many swoony moments with Stephanie’s trademark “awwww” inducing scenes and just like with St. Clair and Cricket in her previous books, Josh is just as desirable. Stephanie knows how to write the gooey, romantic stuff that just makes you melt and wish you had your very own Perkins boy. Isla lives in her own little world with her childhood best friend Kurt, while she dreams of Josh, who she’s had a crush on for three years. And before you make any assumptions, this isn’t a ‘love triangle’ thing. Kurt is practically her brother. Moving on, I’m sure most people can relate to being infatuated by someone from afar. Isla has little confidence in herself, partly stemming from being the shy, softer-spoken sister amongst her more outgoing siblings. But Isla also shuts herself away, sometimes enjoying her own company, but shutting others out to avoid the potential hurt that comes from letting someone into your life. After a brief, chance meeting back home in New York over the summer, Isla and Josh have gone from zero interaction, to sharing small smiles across the halls at the School of America in Paris. And while this small amount of interaction means the world to Isla, she can see that Josh is no longer the outgoing guy she has watched the last few years. After an assumption is corrected, Josh and Isla begin spending more time together. But the reasons for Josh’s sadness and how he deals with it, and Isla’s own lack of self-worth, could potentially become their undoing. My heart burst with love for the characters Stephanie has created and for the cities they spend their time in. Set amongst the magical streets of Paris and the bustling environment of New York and Barcelona, to me, Isla felt like a sort-of ‘love letter’ to those cities. It was so nice to once again get lost in their descriptions and be reminded of the wonderful times I have experienced there. Particularly Paris. I miss it so much and Isla just left me with a deeper yearning. Just like in Lola and the Boy Next Door, Stephanie’s characters from Anna and the French Kiss, as well as Lola, show up in her latest offering. The cameo appearances of Anna, St. Clair, Cricket and Lola were like catching up with old friends and it was such a treat to gain insight into what their lives are like now, and how they are connected to the world of Josh and Isla. Isla and the Happily Ever After has all the feelings of falling in love: the nervousness, the uncertainty, the butterflies, the racing heart, the blushing, the can’t-contain-the-excitement that bubbles out of you… it’s all there. 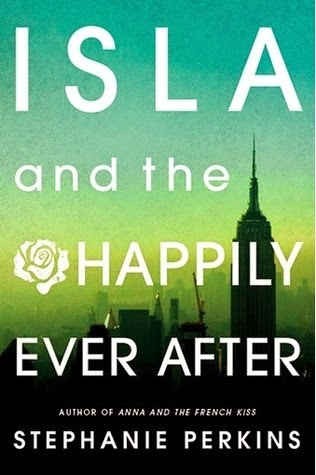 Isla and the Happily Ever After was well-worth the wait (for a number of reasons). I loved it and I hope you do too. Enjoy! So, so glad it was worth the wait and that it pulled you out of your slump! I'll definitely be picking up a copy soon! Thanks for the nudge :) Lovely review!